Wonderful Jean..I love it! Perfect for summer! Posted it on my Antiques And Teacups Facebook page as well! Thanks so much for linking to Tuesday Cuppa Tea! 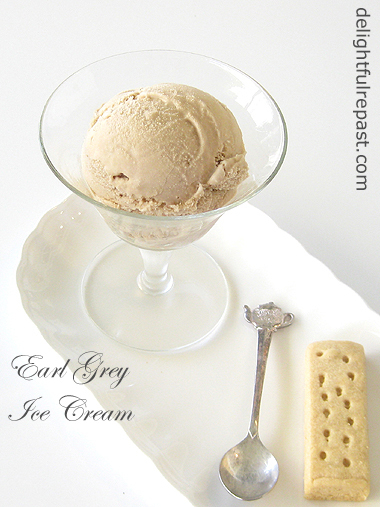 Hello Jean, I never had earl grey ice cream before but this really sounds good. Thanks for taking the time to stop by and sharing this at Cooking and Crafting with J & J. Enjoy your day and the weekend. What, what?...tea ice cream? Now you knew that would get my attention. Guess I’m not surprised they would put dead leaves in ice cream, if licorice, peanut butter and bananas make the cut (never liked banana splits). My jury’s out, though. Coffee works, and the idea of something almost opposite of ice cream’s virtues is appealing to me, sort of like something to clear the palate. So maybe tea works. But still…it’s tea, that slightly acrid grit a large portion of the world’s population puts in hot water. Vanilla grit works for me, coffee grit works for me…soooo maybe. You do it up right for the eyes, for sure, Jeani. Looks tempting…a tease. I mean a TEAse! Ruth, thank you! Since I'm not on FB, your sharing this there is really appreciated. Thanks so much, Julie! Have a great weekend. Sully, if you love coffee ice cream (and I know you do), I really do think you will like this. This is one you really should try! I have a folder of recipes made with Earl Grey and will add yours! Thanks for sharing and linking. Thank you, Bernideen! I'm really starting to enjoy cooking with tea, even though nothing will ever surpass drinking it! Oh, this sounds wonderful, Jean. I have never had Earl Grey ice cream although I have sipped lots of the tea. 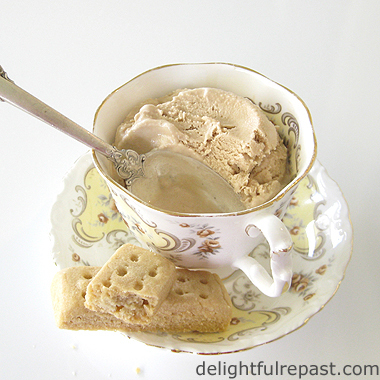 The ice cream looks simply luscious served in the pretty teacup with shortbread. Lovely! Thanks for sharing. Early Grey Ice Cream and previously Earl Grey Shortbread. Earl Grey tea is tea soaked in oil of bergamot which is squeezed from the bergamot orange. So, Jean, what is this thing with Earl Grey tea flavouring? Its named after the second Earl Grey of Northumberland (1764-1845) He was alive at the same time as Jane Austen. How do you do it? I suppose you could make a strong brew and mix the liquid tea with your ice cream mixture. ( must read above recipe.) I am taken aback and blown away by your Earl Grey Tea experimentation. Anita, I'm so glad you like it! I'm always pleased to find another tea lover. Enjoying a cup of tea is one of life's beautiful moments. Where did you get this idea from, Jean? I see you make your tea in a milky brew. I can't get my head round tea made with milk. A good brew needs boiling water to get the essence of the tea out of the leaves. Would it be possible to make the tea with boiling water , strain out the tea leaves and use the tea infusion for your ice cream? Just a good cup of tea would do me. If you come to London, yourself and Mr Delightful, Jean, I will take the two of you out for afternoon tea. Tony, I didn't invent Earl Grey Ice Cream, though I did develop this particular recipe. I'm sure others have infused the tea in hot milk as well, though I didn't really look at any recipes. The reason I did not want to use boiling water is that the addition of water to ice cream is not a good thing. It makes it "icy" and overly hard. I was amazed at how well the tea infused in the hot (though not boiling) milk. That amount of tea in that amount of milk for that length of time will give your ice cream all the tea flavor it needs, I can assure you. It's really quite wonderful, though of course nothing replaces a good cup of tea! If Mr Delightful and I ever make it to London, you are ON for that afternoon tea! Nothing I'd like better. Ooh Jean, I wish I could come over to your house and taste some of your Earl Grey Ice Cream! My grands and I made vanilla ice cream the other day, and they were in heaven. You always share the prettiest food photos and the most scrumptious recipes! Hope you're staying cool with a nice bowl of ice cream. Kitty, thank you so much! I love the way you get your grands into the kitchen with you, sharing your recipes, your time, making memories! Jean my husband is an avid lover of Earl Grey. I can't wait to make this for him. Thank you so much for joining the gathering at Thoughts of Home on Thursday. Laura, that's wonderful! I'm always happy to find another tea fan! Do let me know how he likes the ice cream. Linda, thank you so much! I'll be checking out more of your posts very soon as well! 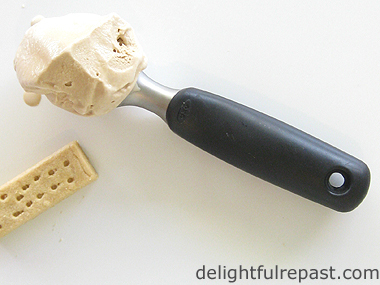 We have unseasonably cold summer this year...so cold that I still haven't made any ice treat..Your Earl Grey ice cream looks so very smooth and creamy...perfect! Thanks for sharing it! Looks yummy and healthy! Thanks, Angie. I wish *we* were having an unseasonably cold summer! But I understand I'm in the minority on that subject, so I hope you get to enjoy some typical summer days soon! Thanks, WW. I try to make everything "healthy," even desserts, so use only organic ingredients and as little sugar as will get the job done. I love earl grey tea, so I am sure that this is a delicious ice cream!! Annette, thank you! If you like tea, just not Earl Grey, you could use another black tea and get good results. Thanks, Amy! I hope you'll give it a try! I just love this delicious Ice Cream served in your beautiful tea cup!! I really appreciate you sharing with us at Full Plate Thursday and hope you have a great weekend! Thank you, Sarah! It really is! Just follow my directions, and you won't have any trouble at all. Edye, thank you! Glad you stopped by! Thanks, Tandy! I hope you love it! Marilyn, your Pins and Yums and assorted shares are much appreciated. Thank you! Hello again, Jean, I've featured this post at the Hearth and Soul Hop this week. It's such a lovely cool summer treat! Thank you for being a part of the Hearth and Soul Hop. Thank you so much, April! I'll go check it out now! Janice, thanks! If you like tea OR ice cream, and especially if you like both, you're sure to like this! After 5 days of 0ver 95 degrees, I definitely ready for some ice cream. Earl gray is my favorite tea. Can't imagine how good it is in the ice cream. Yum!! Wow! What an amazing idea Jean! I can't wait to try this! Pinning. Stephanie, so glad you like it! Perfect for summer tea parties, right? Judee, whew! Sounds like you could definitely use some ice cream! And this is a really refreshing one. Thank you. Thanks, Karen, my new tea friend! Rebeca, thank you and thank you for Pinning! Social media shares are so appreciated. Wow. Sounds and looks delicious, and of course serving it in a teacup is just perfect. I agree, yes, that ice cream scoop does a terrific job. Jess, thank you so much. I would love to do that, but I am not on Facebook. Thank you, Pauline! Wish I had some today. Had to resort to storebought mint chip today! This recipe sounds simply refreshing! Thanks for linking up to the Creative K Kids' Tasty Tuesday, I can't wait to see what you create next week! Amanda, thank you! Yes, not sure how something so rich and creamy can be refreshing, but it is! Looks delicious and so pretty in the tea cup! Thanks for sharing and linking your creative ice cream at "Tea In The Garden"! Bernideen, thank you so much! Your "Tea in the Garden" is always a pleasure! 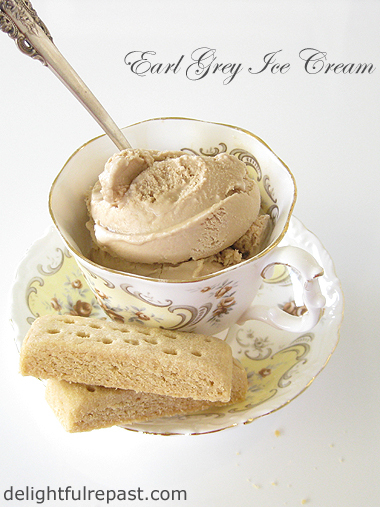 Your Earl Grey ice cream is the perfect marriage of my favourite things! Your beautiful presentation also can't be beat! Margie, thank you so much! That's one of my favorite cups and saucers, a gift from a friend who ordered it from England. I was first introduced to tea in baked goods with a cookie and I was hooked! Earl Grey is phenomenal is cookies and cakes. Now, you've hit me with ice cream!! Oh my gosh! I love it! 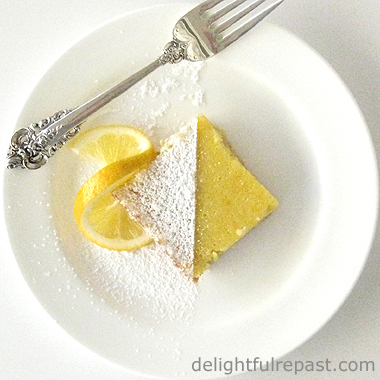 Thank you for linking this one up with us on Happiness is Homemade! We've featured it and I've pinned it!! Lisa, thank you! And thank you for featuring and pinning it - much appreciated! Katie, thank you so much! And thank you for hosting.